So, you’re getting pwned by zombies? Here’s our guide on how to create the best zombie slaying team even if you’re new to the game. The key to kill zombies quick is Critical Hit, since a critical hit on a zombie equals headshot, otherwise known as insta-kill. Your goal here is to try and get as many headshots as possible, and here’s how. 1. Use leaders that boost Critical Chance (+CRIT). Your first Glenn is one of them (+8 CRIT), but we have someone better and his name is Mac (2 stars). You will read the reason below. 3. The most useful characters against zombies are those who have Headshot Adrenaline Rush (AR). We think you can already guess why it is so. And you can easily get these head shooters early in the game (read below). 4. Another useful characters would be those whose AR boost CRIT, like Eugene, Sophie, etc. But since these are not as easy to come by, our only suggestion is to get them when you can. 5. Use items that boost crits, such as Nitric Oxides or Sharpshooters. These are not easy to come by for new player, so unless your town can already produce them in abundance, use these sparingly. 6. Items like Guts and Bloody Shirts, once applied, will make zombies ignore your characters. Guts cover entire party, but only lasts one turn. Shirts lasts 3 turns but only apply to one characters. Since Guts are also hard to come by for new player, build your strategy around Shirts, which would be easier to get and can be manufactured sooner once you have Workshop level 4. 1. You should be having a Level 1 Training Ground that can do Weapons Training by now. If not, go build it. It shouldn’t take more than a couple of minutes of building and researching. Once that is done, train some people with Weapons Training. 2. Your aim is to get as many Macs and Georges as you can, at least 10 for every character you need. Level up a Mac with the other Macs, or a George with the other Georges. Once you spend 9 of them, you should get a Mac/George with his AR level maxed (10/10). 3. Create 5 of these maxed AR Georges/Macs. How many Macs or Georges out of the five should depend on which ones you can equip best, but make sure to have at least one Mac. Why, because Mac’s leader skill is +8 CRIT. You may think Glenn is better because he is +8 CRIT and +10% ATK, but Mac is ranged which means he can reach more target, and you can use sharpshooter to boost both the leader and the rest of the team, instead of one or the other. 4. Now deploy this team with Mac as leader, and watch the headshot galore begins. 5. Zombies on later level would be harder to crit hit, but hopefully by that time you already have better crit leader and/or crit booster. 6. Characters to seek for upgrade: Timothy (3 stars), and Amy (4 stars). Be aware that it might take more time to max their AR levels. They do dish out more normal damages, though. How effective is the team above? Well, I’ve now reached mission 15 on a new server while still using that team with only one change: We have Sophie as crit booster. Currently working to get a couple of Timothy to 10/10. 1. If you are going to use a crit booster, use it early on, i.e. at the start of turn 1 of a wave. 2. Try to kill zombies that can approach you faster first, and try to kill zombies that are about to attack so that as few characters will be threatened. 3. Only use Guts if the majority of your team is threatened. Otherwise use Shirts, and only on endangered team member. See zombie threat map below. 4. Try to use Headshot AR as a last resort, which means don’t use them on distant zombies. You probably won’t get another shot for that level. 5. When zombies are next to your characters, use Headshots on the middlemost zombies first, because they threatened more of your characters, and work your way out and to one side. See threat map below. 6. If you have more Headshot AR ready than there are targets, try normal attack first and see if it produces normal headshot. We once had 4 Headshots and 3 targets, ended up using only one instead of three (got two normal headshots and one miss, used a Headshot on the last target). 7. Try to use character traits to your advantage. For example, Sophie is worth loosing one head shooter because she can boost crit with her AR. And she have Tenacity, which means she cannot be one-hit-killed by stronger zombies, so if you are short on Shirts, you can use it on some one else. Numbers are zombies and show how many characters they can potentially attack, C are your characters. Zombies always attack characters directly in front of them first, and someone on the next line second. Adjust your kill priority accordingly. Do you got any other tricks? 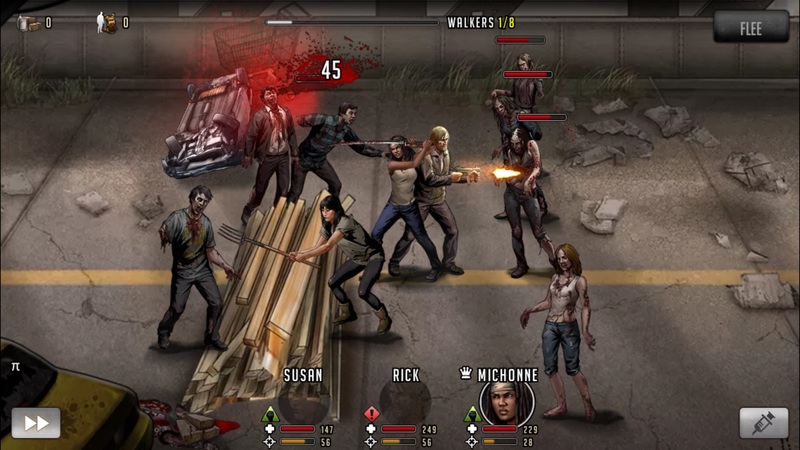 How to you build your best team for The Walking Dead: Road to Survival? Or do you have any critics or suggestions? Comment below and we will put it in future updates. 1 Comment on "Best Team – The Walking Dead: Road to Survival"